Microsoft, finally, released details on the point release of Windows 8. Windows 8.1 will feature more customizations for the Start Page, deeper search functionality (ala Bing) and will mark the return of Start button…sort of. First, and most importantly, Windows 8.1 will feature more robust applets and a new store. The release will also give the user a lot of new customization options for the Start Page. Among those features: a background that matches the antiquated desktop. I’d say it’s about time too! Though, it will render my ‘Decor8’ app from Stardock a bit less useful. Users will also get more choices in the size of the tiles. New sizes include a small one that puts four tiles in the space of one current tile; a double height tile for more information and more. In addition to matching the antiquated desktop background, Start Page now supports animated backgrounds (a feature from Vista that seemed to have disappeared with 7.) I loved the animated backgrounds from Windows Vista and am glad to see them return. Photo slide shows make an appearance on the lock screen now. An interesting change that will be made to the Windows Store is that apps you purchase will no longer automatically appear on your Start Page. They will go into the list of apps (swipe from the bottom of the Start Page or right click a blank spot on your Start Page and the select the ALL APPS icon) after which you can pin to the Start Page if you wish. I didn’t realize this was an issue for some, but, apparently, it was. The boot options have been changed as well. You will be able to boot to the Start Page, antiquated desktop, ALL APPS or some other view of the Start Page. I like this. I was opposed to only have the antique desktop as an option, but these other options make sense and I’m glad to see them. Mouse and keyboard navigation has been improved as well. Perhaps the most asked for change-return of the Start MENU-was ignored, fortunately. However, Microsoft has restored the Start BUTTON. On the non-desktop (antique desktop, that is) screens, the Start ‘tip’ (as they are now calling it) will only display if you hover the mouse over the lower left corner of the page. On the desktop, it will display in the same spot as the Start Button. No matter where you see it, tapping or clicking it will take you to the START PAGE. However, with the new options, you can make the Start Page appear to have the same or similar functionality as the old and lame Start Menu. Other interesting changes and additions include the excision of IE 10 and appearance of IE 11. There are more settings available on the Metro side and SkyDrive (or, I’m guessing, a similar service) is even more integrated. Perhaps the most important thing that Microsoft stated: a date for the ‘preview’ version: June 26, 2013. I’ll be ready to download and install the update the day it is ready. These changes (there were more, read about it all here) appear to make Windows 8 more appealing to more people and, perhaps, quell some of the negativity about this nice operating system. PS: Microsoft, PLEASE, PLEASE, PLEASE ditch the damn desktop. That is all. 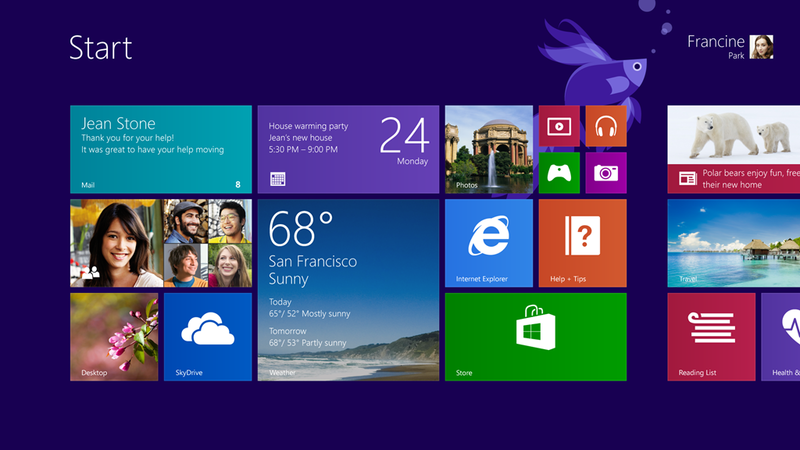 Microsoft is about to release an update to Windows 8, cleverly called Windows 8.1. Among the many improvements: more Modern UI goodness for control panel items, better multitasking and…tada! The Start Button and a boot to desktop ‘feature’. Yep. Microsoft caved. Months and months emphatic talk from the company, which took a hard line on these two features: Neither were coming back. Well, they are. Apparently, an edict came from high up in the company (Ballmer?) to restore these features. So, 8.1 will deliver (supposedly, but, as Mary Jo Foley points out, we won’t know for sure until it actually releases, things could change before then) a Start Button and an option to boot to the desktop. It isn’t as bad as it seems, thought. The Start Button is just a button that takes you to the ModernUI Start Page. Yup, no start MENU, but the Start PAGE. I can deal with that. It’s the boot to desktop that is a bit harder to swallow. It isn’t necessary, you can get to-easily-all of your applications, ModernUI or antique desktop via the Start Page. However, since all the Start Button will do is take on back to the Start Page, I guess this arrangement is more palatable. I am guessing, though, that Microsoft has improvements to the Start Page in the pipeline to make it somewhat easier for those who still seem to have a difficult time with ModernUI. Microsoft says a public preview of 8.1 will be out in June, but I’ve heard that these changes will NOT be in that preview. So, we will have to wait until sometime in September, when the final code is unleashed. Windows 8 will soon be for real, meaning it will be available, in it’s official release, in October (the 26th.) If you are worried about missing some of your favorite features-and many are-fear not, they can still be had. Since Microsoft announced the expulsion of the START ORB and MENU, many have lamented its passing. Some even going so far as saying it will kill the operating systems acceptance. That’s just wrong, but, for those who do want the little beast, Stardock has your answer. 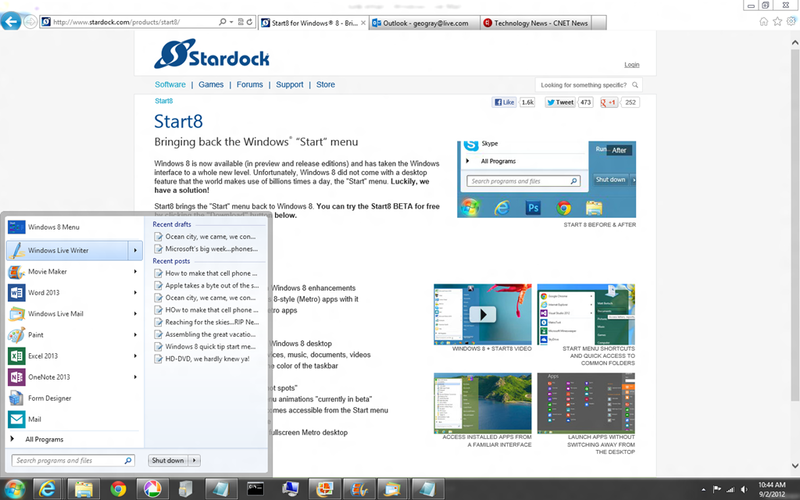 Called Start 8, it is a start menu worthy of something from Microsoft. There many options for Start8, like allowing you to go straight to the desktop upon logging in and using the Windows 8 style menu page for the start menu. I like this option a lot, it gives you the best of both worlds: a quick way to start applications while staying in the desktop yet taking advantage of what makes Windows 8 so nice. Once you select the Windows 8 style, you have more options. 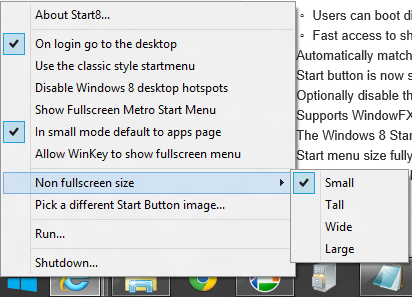 You can select the size of the Windows 8 menu, search and set Windows settings. For now, the application is still in beta, and it is not perfect. After a few uses, the Windows 8 style menu, for example, ceased to display once I started a Windows 8 style app (the News app.) I know Stardock will fix that, likely in the next release. Stardock releases quality apps and this looks like one. It is currently free. Aero8Tuner brings back the Aero effects that made Windows Vista and 7 so beautiful. While the flat look of 8 is nice, I like the transparency of the last two versions of Windows and it will be nice to have it if I want it-which Microsoft should have allowed anyway. Aero8Tuner gives you other options like coloring the window borders. As I am still running the Release Preview, which still has Aero, I have not yet tried Aero8Tuner, but it looks promising and I will definitely follow up on this once I get the final release of Windows 8. Redmond Pie has an article here. Windows 8 does away with the Start menu and orb. For many, this is a major source of irritation with the new operating system. Microsoft replaced the orb and menu with corner hotspots. Hover the mouse over the lower left corner and you see either the START PAGE if in a traditional Windows application or the desktop OR see a thumbnail of the Windows Desktop. Either way, if you right click what ever pops up, you’ll see many of the features that were in the old Start Menu. 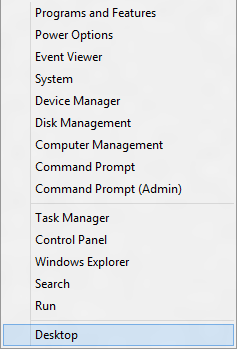 For example, the RUN command is there, As is Control Panel, Windows Explorer, Search and Task Manager. More common control panel functions are also included, like Power Options and Device Manager. While this may not replace the Start Menu, it does help to quickly get to some of that functionality. Windows 8 is here. Sort of. Last week, Microsoft released a ‘developer preview’ version of the next iteration of Microsoft’s ubiquitous operating system. Aimed at developers and those want an early glimpse of the next release, this edition is not yet ready for prime time. While it is not yet ready for prime time, the build is pretty solid and I am, in fact, writing this blog on an ancient HP laptop running Vista and Win 8 in a dual boot configuration. I have to say, the Win 8 release has actually breathed new life in this old machine. More on that shortly. I have downloaded two different versions of the OS: the full, 64 bit developer release, complete with Windows 8 development tools and the stripped down 32 bit OS only. I am running the 32 bit version on this laptop and the 64 bit developer release on one of my desktops. Metro is the name for the new UI. Originally designed for the Zune, the interface has changed since its Zune days and is a beautiful, smooth and highly useful interface. It is quite obvious, though, that Metro is designed for touch and not the keyboard/mouse, though it does work just fine with the mouse and keyboard. Interestingly enough, the redesigned Metro (from the phone and Zune) looks better on my laptop than it does on the Windows Phone 7 phones I’ve seen. I think it has to do with the screen size more than anything else. I am, however, very anxious to try it on a tablet computer. Installing the operating system was a snap. I decided to create a partition on one of my drives (on the desktop) by shrinking a volume to create a new volume. I created a 30gb partition-which is really too much-on my terabyte drive. The OS installed in about twenty minutes. The first reboot (after the install) took about 45 seconds as it scanned for hardware and then each subsequent boot was less than 20 seconds. On my laptop, I did the same thing, shrunk the drive and created a new partition – 20 gb for this one – and installed. One thing it did on both machines was to create a new boot manager. The new boot manager is a pleasant blue with the list of operating system for you to choose from. This one is more graphical and easier on the eyes. Both versions came with a few sample applications, a few of which are very nicely done and would be worth actually buying. There are a handful of games, a few social tools (twitter and facebook clients) and some utilities. They are all Metro styled and look fantastic and work smoothly. I have heard that they were developed by interns at Microsoft. If that is true, Microsoft needs to hire these people, post haste. I think even the most jaded Windows user will like the n ew start screen. 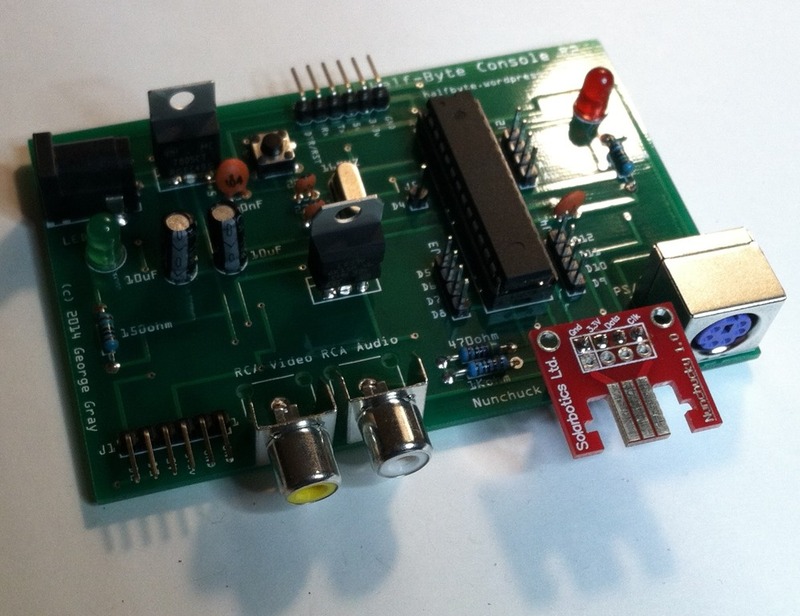 It is composed of the live tiles and very, very easy to use. Click or tap a tile and that application is launched. The tiles are live in that they can display information from the application. For example, the weather app will display weather information and is updated in real time. The Twitter client displays live tweets and, of course, the RSS app shows your feeds. I have yet to dive into every feature of the start screen (or learn the shortcut keys, which you will appreciate) but it looks and works great. The standard Windows desktop is still there, though the Start button takes you back to the start screen and NOT the Start menu-which I am happy to see go. 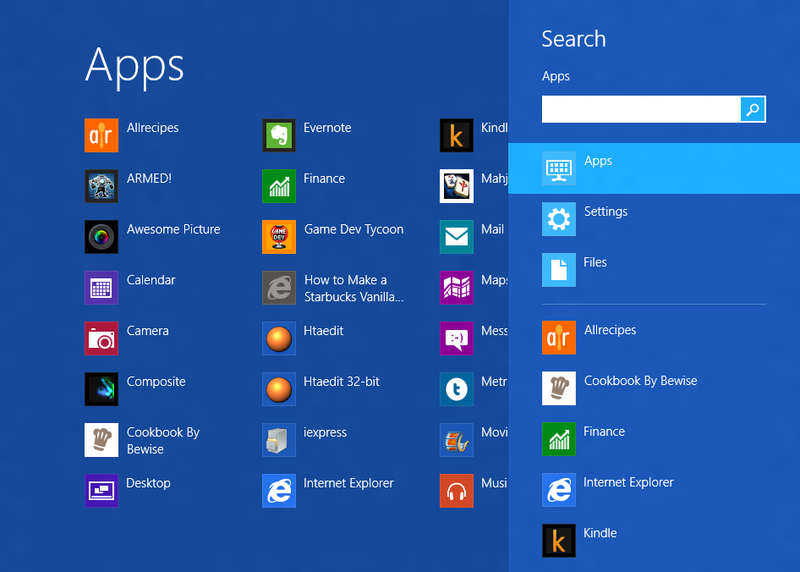 However, don’t fret…the start menu is still there. As is all of the old Windows goodness you’ve come to love. Some have been updated, like Explorer and the task manager. Explorer has gained the ribbon. Perhaps the most impressive application is the new iteration of Internet Explorer: IE 10. IE 10 is not only fast, but it comes in two flavors: metro and ‘normal’ desktop. The IE 10 desktop version looks and works like the IE9 we all love, it’s just much faster. IE 10 Metro, however, is just gorgeous. IE10 Metro ditches the menu bar and the status bar, does not use plug ins and is super fast. You right click toward the bottom or top of the screen to bring up the URL bar, tab list and forward, back and refresh buttons. They go away when you are done. It leaves you with the whole picture. No awful menus, ribbons, tool bars, etc to get in the way. It looks great. However, like the iPad version of Safari, there’s no FLASH. Or Silverlight. Or anything else. Just HTML5 and CSS3. Good, bad? All in all, the developer preview edition of Windows 8 is most impressive. So far, the only real bug I’ve seen was that it loses its mind when it comes out of sleep on the 64 bit version. It is beautiful, smooth and looks like it will run on all types of hardware. If you have an old computer that could run Vista, Windows 2008 or Windows 7, it will run Windows 8 just fine. I am anxious, now, to play around with a more refined beta or pre-release edition. This thing is going to change the market for tablets too. Just wait and see.